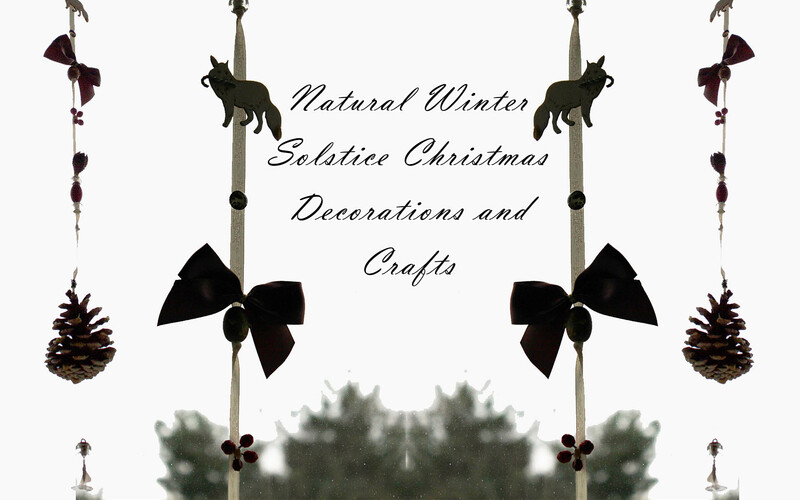 Winter solstice is on the 21st – 22nd of December and it’s the shortest day of the year. This day brings us the joys and hope that the days will begin to get longer, together with the warmth of the sun and the promise that spring is on its way. This event was traditionally celebrated by the Celtic and pagan people and it is still celebrated to the present day. In Ireland, there is an ancient tomb called Newgrange and on the morning of the winter solstice, the chamber becomes illuminated for approximately 17 minutes due to the way the site was built, following the astrological alignment. There are many ways to celebrate this ancient tradition in the modern world, so we have put together some fun yuletide crafts for the whole family to get creative and enjoy bringing the festivities into the hearth and home. 1) Measure how much length of your preferred hanging materials you will need and add approximately 2 to 3 inches as this will allow for any knots or loops you will be making to tie in your chosen festive decorations. 2) Make a loop at one end of the length, as this will allow you to hang it from a hook or nail when you are finished. 3) Lay the length down on a flat surface and start to play around with the decorations to see how you would like to arrange them. Try and leave nice spaces between each so that it doesn’t appear cluttered. 4) When you are happy with your arranged decorations, you can start to tie or glue them on (you could use a hot glue gun or any other strong glue). 5) Have a cuppa and wait for any glue to be completely dry. 6) You can now start to add your Christmas favourite essential oils to any pinecones, ribbons or cinnamon quills you may have used and you can top them up as often as you like! 7) For an extra bit of illumination and sparkle, you could add a crystal or glass cut bead or sun catcher at the bottom. This will help weigh it down and illuminate your home with rainbows when it catches the sunlight just right. This is a really simple and fantastic idea to get those yule time feels when you’re on the road, whether you are going to work or visiting the family to spread some Christmas cheer. 1) As for the craft above, we suggest you pick either a pinecone or some cinnamon quills that you can attach to a decorative ribbon. You can then add some elastic to the ribbon to allow you to attach it to the rear view mirror. 2) As a final touch, you can add your favourite essential oils or fragrance oils making your car smell wonderfully seasonal.